The Honor Flight network began in 2005 as a way of honoring veterans by flying them to Washington D.C. to see their memorials. Since then, over 220,000 veterans have made the trip, free of charge. While the program has done a remarkable job in giving these veterans the honor they deserve, the reality is a lot of veterans, particularly those from the WWII and Korean War era, are not fit to make the flight to our nation’s capital. To ensure those veterans are not forgotten, the Honor Flight At Home program was created to give them a virtual experience of what they would see in D.C. More importantly, the program allows for a celebration, many of whom never received, of the unimaginable sacrifices they made for the country. After both attending and working Honor Flight At Home events in Florida, where she spends her winters, former Delaware and now-Marion resident Margie Saull came home with the intention of bringing the program to central Ohio for the first time. On Saturday, Aug. 18, she will have done just that, as 31 veterans from Marion, Delaware, and surrounding counties are set to be honored at Tri-Rivers Career Center in Marion. Saull, the daughter of a WWII veteran, said her affection for veterans was the driving force in creating the event, and that she hopes the program will be something Honor Flight will be proud of, and given the need, will turn into an annual event. Saull added she worked step-by-step with Honor Flight Columbus Board President John Shore in setting up the event. In addition to the virtual tour of the memorials and monuments, American Legion posts and the Marion Harding High School Junior ROTC will be participating, and there will be a guest speaker. Following the festivities, everyone attending will form a “gauntlet” outside the hall that the veterans will walk through as they are showered with thanks and gratitude for their service. 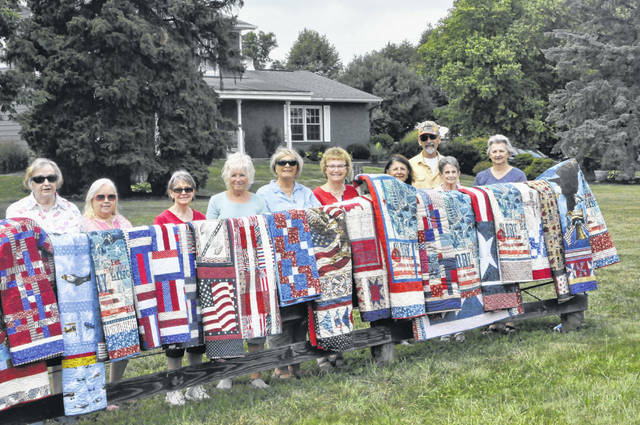 Each veteran will also be presented a hand-made, patriotic quilt, sewn by a group of people in the Waldo area who wanted to do their part in thanking the veterans. Sandy Lewis, a close friend to Saull, initially proposed the idea while in Florida. In conjunction with Sue Stafford, who owns the local quilt shop and offered generous price breaks on fabric, work on the quilts began in February and was just recently finished. Badger estimates she made around 20 of the quilts, each taking about three hours to complete. Saull’s hopes of the event becoming an annual celebration are off to a good start, as she said she is already receiving calls and applications for the next event. She noted it is imperative veterans submit the application so they may ensure the veterans have never taken an Honor Flight previously. Like Honor Flight, Saull is putting a priority on World War II and Korean War veterans, but also understands there are many veterans of Vietnam whose health is declining and might become a priority. Anyone interested in applying for next year’s event may contact Saull at 740-360-8902.